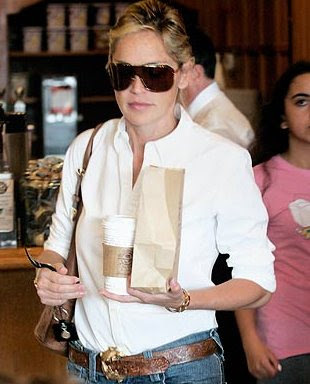 Behind those dark sunglasses it's hard to guess what kind of coffee Sharon Stone is drinking. If I were to guess I would have to think she took her coffee black. If I remember correctly one of her films that she filmed with Michael Douglas was one of the first main stream blockbuster hollywood movies to have two movie icons actually giving a spring performance of the birds and the bees. The name of the movie slips my mind but it definitely woke me up and I wasn't even roasting or drinking coffee.